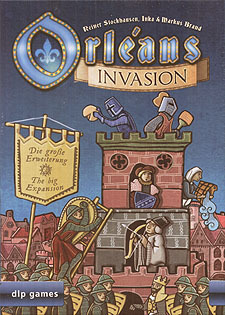 After many years of peace and quiet, Orleans is facing turmoil. Invaders are threatening the city. It is time to leave the competition behind and join forces in protecting Orleans... Discover totally new worlds around the popular bag building game in 6 new scenarios. This variant introduces secret objectives to the game, for which you receive additional points. Move the carpenter around to build buildings in certain places and make sure they are being managed properly. On your own, complete objectives of different difficulty in various solo scenarios. Aside from a proper strategy, you will also need some luck to draw the right person from your bag at the right time. In the two-player variant "The Duel", you play directly against each other. The player who first completes all four objectives wins. In case you both complete them on the same round, your supplies will decide who wins.